Happy National Coffee Day, folks. On this most momentous occasion, you might gaze down into your morning cup and wonder, “Where did this amber nectar come from? How did it come to sit before me in it’s current delicious form?” If you do indeed wonder where your coffee comes from and want to see it first-hand, listen up, because for this year’s National Coffee Day, we’re getting back to the beans. 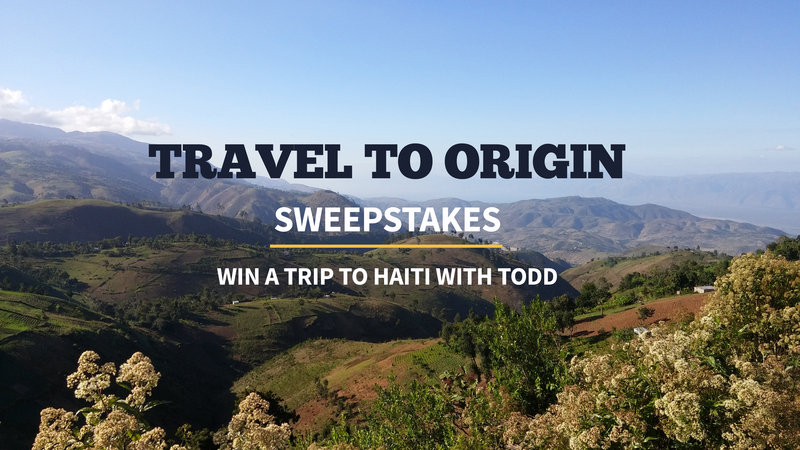 Enter our Travel to Origin Sweepstakes and you could be picked to go on a trip to visit coffee farms in Haiti. One winner and a friend of their choice will travel with members of our coffee sourcing team to meet farmers, see how coffee is grown and, best of all, taste coffee at it’s source. If you’re seriously into coffee and have always wanted to go to origin, you’re gonna want to enter this sweepstakes. The trip includes round-trip airfare and 3 nights hotel lodging for two, tours of 2 Haitian coffee farms, cultural activities in and around Port-Au-Prince, AND (if that doesn’t sound like the best thing that ever happened to you) the winner will also get a 1-year supply of coffee. We had to go big for National Coffee Day, right? So yeah, obviously enter here. Read terms and conditions here. Where do you enter? I do not see anywhere to click? It “seems” like you can enter over and over again, but I just read the rules again and only your first entrance will be accepted. Additional entries by the same email address will be thrown out.